If you have been suffering from chronic lower back pain, you would feel weak, unsupported and unbalanced. What leads to chronic back pain is a lack of synergy with all of your muscles, especially the ones designed to support your back when you move and lift objects. A muscle spasm is an overriding protection mechanism that typically occurs when a muscle or muscle groups are overused, tired and fatigued. Find out all you need to know about Back Spasms! Are you sick of seeking different treatment and advice for you ongoing back pain? Why is a lower back spasm so painful? The lower back typically goes into spasm as a protective mechanism against further pain or damage to the lower back. The Health industry fails chronic back pain suffers? Find out why the health industry fails you and so many others. The definition of chronic back pain, is pain or dysfunction that prolongs for a period of 3 continuous months. Why you need to see a chronic pain specialist. If lower back pain is just a symptom, then what is the true underlying cause? 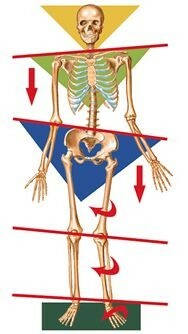 If the pelvis is tilted forward, one's centre of gravity will be forward of their midline. If their entire upper body was to be forward then that person would walk around with their entire body on the same angle as their pelvic tilt. Do lower back pain exercises prescribed by therapists actually work? Find out how and if your lower back exercises will work for you! Why does my back keep getting inflamed? Muscular weakness is the true cause of back pain. Find out why muscular weaknesses causes back pain. The body is designed to move, and move in a functional manner. “Use it or lose it” is the best catch phrase to describe why people get muscular weaknesses that result in chronic back pain. Lower back pain is also known as lumbago. The problem is quite common in the world we live in, and there are several reasons behind its occurrence. Some of the most common reasons are sitting and /or standing in a bad posture, infections, accident or trauma, tumors and degenerative changes in the spine that occurs with age. Sacroiliac Joint Dysfunction or simply SIJ is a disorder in the lower back that refers to, too much motion or too little motion throughout the sacroiliac joint. It is an extremely common condition the plagues many Australians each and every year.